Logi Analytics - Perception Consulting Ltd.
Logi Analytics is an ultra-powerful BI tool that allows businesses to view and utilize their data more efficiently by developing engaging analytics applications. As the only Logi Analytics Gold Partner in Ireland and Scotland, Perception is committed to licensing, support and development on the Logi platform for our customers. In the past few years, the Perception team has successfully built interactive, bespoke analytics applications for several large companies and state bodies using Logi. Considered the number one Analytics Development Platform in the world, for the past two years Logi has ranked #1 for embedded analytics out of 16 vendors in Dresner Advisory Services’ Embedded Business Intelligence Market Study, and it is this embeddability that sets it apart from other BI/analytics platforms. With over a decade of experience in embedded analytics, Logi has been behind applications for some of the world’s largest organisations. As an integral European Logi partner, Perception works extensively with its customers to understand their specific requirements, from the ETL phase to visualisation and deployment. Logi’s customizable platform provides the application developer with the flexibility to create clear and concise reports, analytics dashboards and product-worthy pieces as per those requirements. Aside from the developer platform, one of Logi’s most attractive features is undoubtedly the Self-Service Reporting Module (SSRM), which encourages the application user to discover and develop insights for themselves, without having to call upon the IT team for assistance. When it comes to choosing which platform to utilize, if an organization simply needs to enhance its current analytics platform with data visualisation, then Tableau is a good way to go. However, if a broader BI capability is required, then Logi Analytics offers itself as a capable, well-equipped solution to enterprise needs. From a developer point of view, there is admittedly a steep learning curve to Logi, but once it ‘clicks’, the platform will allow for the swift creation and deployment of interactive dashboards, charts, graphs, reports and embedded analytics for any number of users. With support for database write-backs and the ability to initiate back-end processes from within the analytical content, end users can update source systems in the same context as their analysis. Most importantly, they can update the data in a secure and managed way through the Logi application. Logi Info’s ‘Elemental Design’ approach enables prompt time to production, agile development and iteration cycles, and low impact on development resources through the configuration of pre-built application elements. The Logi Studio platform provides a rich set of out-of-the-box capabilities, with a continually updated library of hundreds of elements for data visualisations, dashboards, and reports; self-service analysis; interactivity options; user input controls; data source connectors; and processes. While the pre-built elements allow applications to be created through simple drag and drop, Logi’s flexibility in extending out to external libraries means that coding is still possible. Logi Analytics supports very sophisticated embedding, so that BI applications can be made to look part of other operational systems, and consequently helps in achieving the end-goal of a smarter day-to-day user experience. 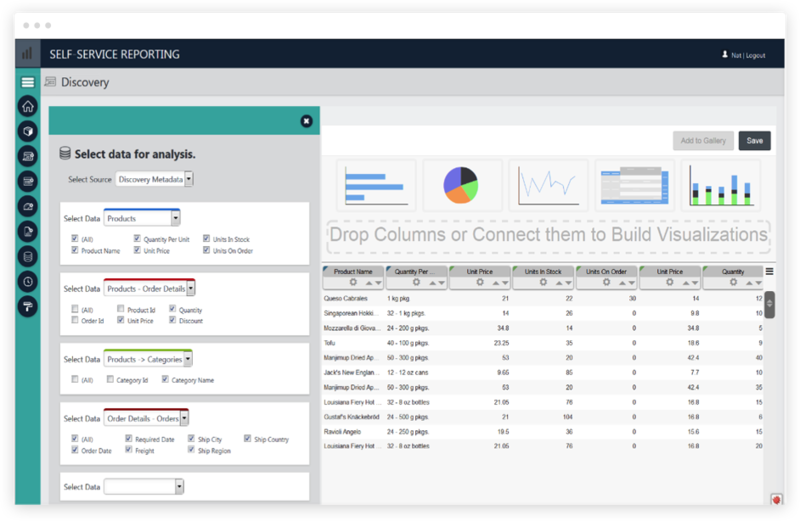 Embedded analytics sits in contrast to traditional business intelligence practice, which consists of a set of independent systems aggregating data from multiple sources and reporting on it from a central view point. This can be inconvenient for the user, as BI and business process applications have entirely separate interfaces, forcing them to switch between multiple applications to view and act on their data. With the power of embedded analytics however, insight and action is included in the same application; decision-making related to a variety of tasks is supported, regardless of whether data is required from multiple systems or aggregated views. Essentially, the embedded analytics method is far easier, quicker, and cheaper than replacing a whole legacy system. The Logi platform allows for ease of integration with any security system, and provides IT with access controls so that employees have access to reports and pages – right down to certain application elements – based on their role and associated rights. Single sign-on integration is supported for any security framework or application, including LDAP, Windows Active Directory, and custom databases that store user profiles. The Logi SecureKey feature supports server-side passing of credentials from custom applications for embedded use cases, and because user information is not stored in Logi Info, security integration is simplified, as is the removal of the overhead of continuously synchronizing numerous profiles. At Perception, we have found that Logi’s Self-Service Reporting Module is the most attractive feature for clients when considering the platform. The popularity of the SSRM lies in the fact that it facilitates the discovering and configuration of new, independent insights; allowing the authorship of dashboards and reports with minimal training required. Thanks to the SSRM, application users can select from managed data sources, customize data fields, create their own tables, charts, graphs and reports via drag-and-drop, and easily share and schedule reports from a central interface. Logi comes with connectors for a wide variety of data sources, including databases (MySQL, SQL Server, Oracle etc. ), applications (NETSUITE, SAP, QuickBooks etc. ), cloud applications (Salesforce, Eloqua, Marketo etc. ), Web Services and flat files (Excel, CSV). The platform also leverages a plug-in model that extends support for proprietary data sources or for adhering to customised security requirements. Insights from multiple databases and application sources can be displayed together by blending data into a single visualisation, dashboard, or report. Additionally, with support for database write-backs and process initiation, end users can update source systems in the same context as their analysis, increasing user efficiency. Logi produces industry-standard HTML5 output, so its rich interactive applications are instantly accessible on Apple iOS, Google Android, and Windows mobile devices, avoiding the high cost of platform-specific development. Along with a responsive user interface and touch interactivity optimization, Logi Info applications can also be embedded within native mobile apps, offering the same level of functionality as the browser-based content. 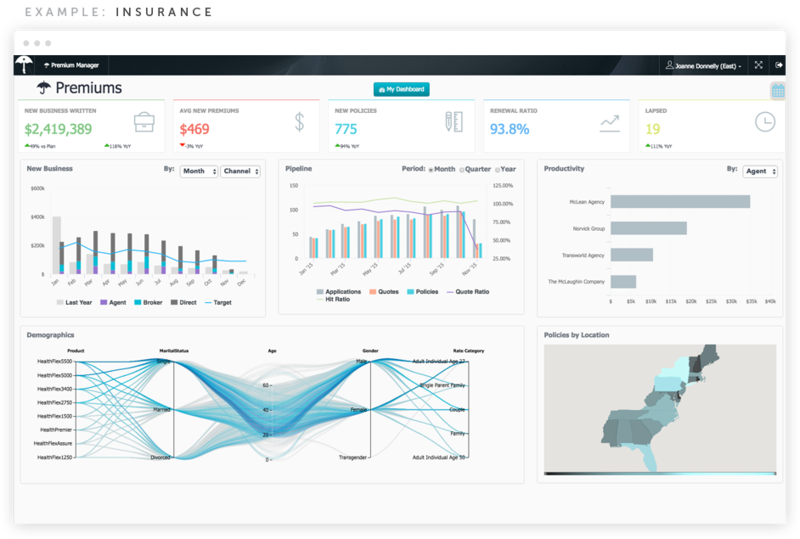 Data visualisations, dashboards, and reports built with Logi allow the user not only to interact with the data, but to take action on it immediately. With database write-backs and the ability to carry out back-end processes from within the analytic content supported, end users can update source systems in the same context as their analysis. And most importantly, they can update the data in a secure and managed way through the Logi application. Although Logi Analytics has not achieved the popular global status of some other suppliers, such as Tableau, after considerable investment in recent years, it now has products to compete with the best in the BI world and is worthy of consideration. Contact Perception for more on Logi!